My Birchbox subscription has officially come to an end. For my last box I decided to get the all-curated box for the first time, instead of picking one sample and having the rest be a surprise. Overall I was pretty pleased with this box. There was only one dud, and honestly I was kidding myself thinking it would work for me. 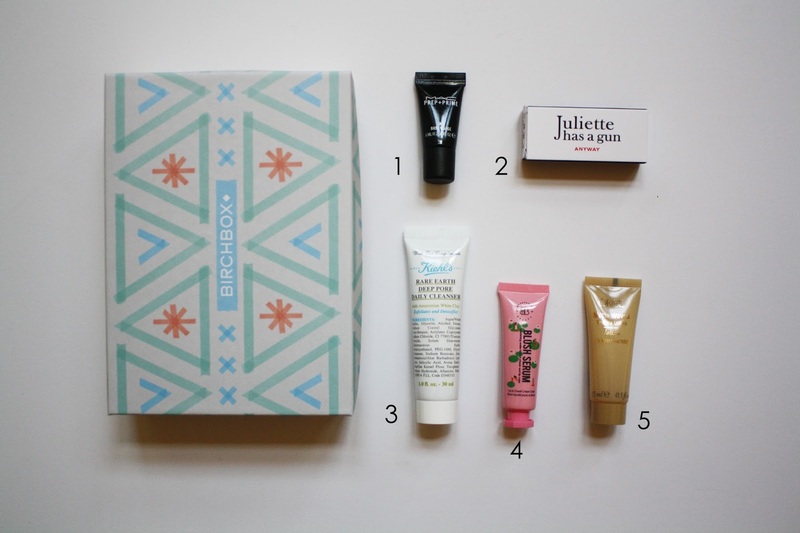 Since this is my last Birchbox I guess I should answer the question: would I renew? I definitely enjoyed getting a Birchbox each month and discovered so many great new products, especially R+Co's Analog Cleansing Foam Conditioner, that was the standout product from all of the boxes that I received. This subscription was a gift from my in-laws, so obviously I didn't pay for it. Compared to Ipsy, I don't think that Birchbox is as good of a value, however Birchbox and Ipsy usually send me very different products. I would renew, however I'm not going to right now simply because I'm trying to be a little more responsible with money. I probably will renew eventually, but not right now. MAC Cosmetics Prep + Prime Skin, $31- I couldn't tell if this made my makeup last longer. It claims to even out skin redness and add radiance, but again, I didn't notice any difference. However, I liked it more than the Smashbox primer that I was sent in last month's box because it felt more like a moisturizer than a gross film on my face. I wouldn't buy this, but I'll definitely use it till it's gone. Juliette Has a Gun Anyway Eau de Parfum, $100- This perfume is citrusy and floral, so I thought it would be perfect for me...and I'm not saying that I don't like it...but I can't tell if it's more of a mature scent than I'm used to or if I'm just so set on the usual perfumes that I use that everything else smells odd to me. Even though this is citrusy and floral, I think I'm going to save the rest to use in the fall and winter, I think it would be better then. Hopefully someone out there will understand what I mean by all this. Kiehl's Rare Earth Deep Pore Daily Cleanser, $22.50- This is the item I was most excited for from this box. I was worried that it would be a dinky sample size, but it's pretty decent and the product goes a long way. It exfoliates and cleanses and leaves my skin feeling so soft and clean. I'd definitely buy this. Beautaniq Beauty Blush Serum in Sunrise, $16- I was expecting this to be more gel-like, but it was pretty creamy-- actually extremely similar to the NYX Whipped Blush that I got in my June Ipsy bag. This product also goes a very long way, I swatched it on my hand using a little blob and it was, um, more than enough. I looked like I had painted the back of my hand pink. But that was good to know before I put it on my face! This is a really pretty, natural-looking blush and goes a very long way. Oribe Matte Waves Texture Lotion, $42- I am always so hopeful when I try out texturing hair products and then I instantly regret putting it on my head. I put a tiny amount of this in my hair, and while it did make my hair slightly more wavy, it made my hair feel disgusting. I wanted to get back in the shower and rinse it out. Have you tried any of these products? 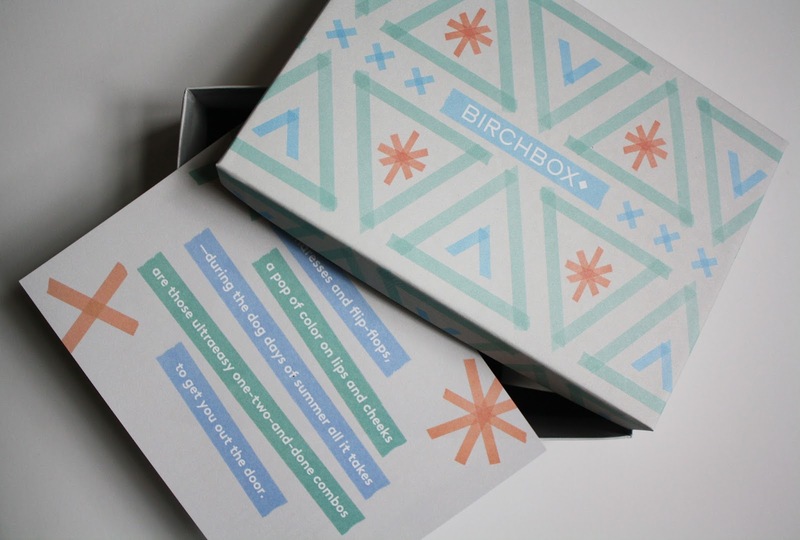 Want to try Birchbox?